Thank you for visiting the North American Bluebird Society (NABS) website! Here you can learn about the different species of bluebirds, how to attract and care for them, and download educational materials. You can also join our conservation efforts by becoming a NABS member. NABS was founded in 1978 by Dr. Lawrence Zeleny in order to promote the preservation of bluebirds, a cavity-nesting species in decline. Larry, with the support of his wife, Olive dedicated much of his life to providing nestboxes and managing bluebird trails. He promoted bluebird conservation through hundreds of talks and articles in many periodicals. NABS’ core mission is education, conservation and research, to mirror the life of Dr. Zeleny. His book, The Bluebird: How You Can Help Its Fight for Survival is a testament to what he called, the “symbol of love, hope and happiness,” the bluebird. To learn more about the history of NABS, visit our NABS History page. If you have an emergency situation with your nesting birds, please contact our Hotline for assistance. You can also make contact with us via our NABS Facebook page where you can send us a private message. Find an injured or orphaned bird? The NABS By-Laws have been reviewed and some revisions have been proposed. Click here to review the suggested changes. A vote of the membership will take place this summer. Watch for your ballot in the summer edition of the journal, Bluebird. If you are having a Bluebird Emergency, please visit our Contact page for the NABS Hotline contact info. Members are encouraged to visit our Legal page to review information related to upcoming membership meetings, elections, and proposed by-laws changes. Save the Date! Plans for the next NABS Conference are in the making! Stay tuned for more details! Do you have an upcoming event you'd like to have included on our calendar? Use our Event Submission form to tell us about it. NABS is now registered with AmazonSmile. To donate a portion of an Amazon purchase to NABS at no additional cost, click here for more details. You will be asked to log in with your Amazon username & password (or create a new account) and then select NABS (North American Bluebird Society) as the organization you wish to support. Banner photo © Dave Kinneer. All rights reserved. 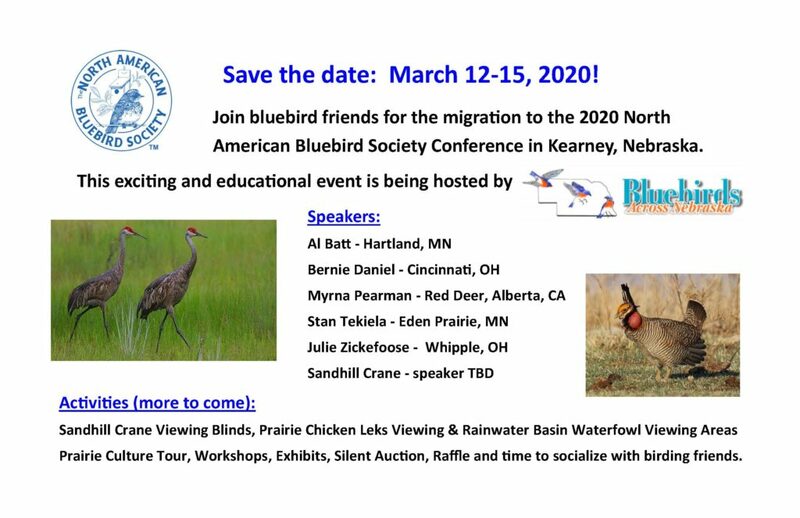 Copyright © 2019 North American Bluebird Society. All rights reserved.